← Physical Education for The Good Life! I made this little kitchen for my daughter’s birthday. I found a little dresser at a used store. 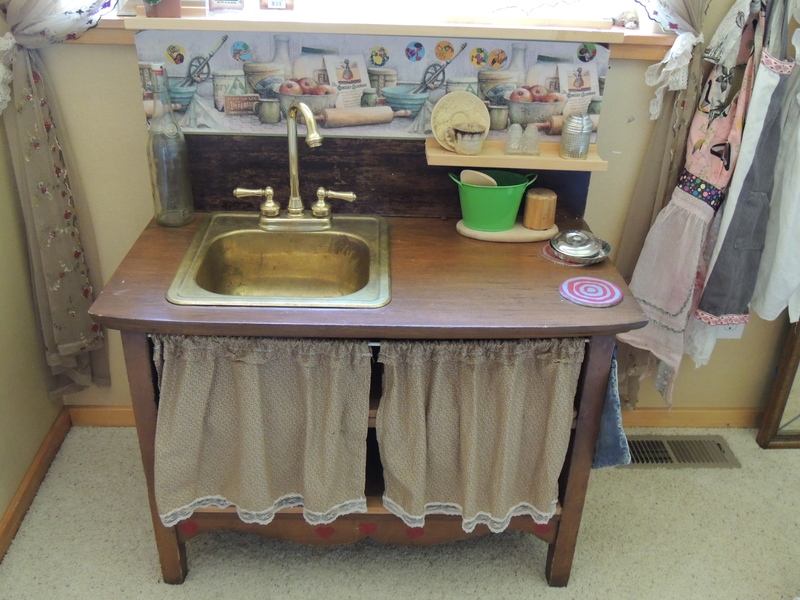 They also had a brass sink, the lady was so excited about my project that she GAVE me the sink when I bought the dresser. It was $50. Very cute, great shape and great size. I had an old piano bench that was broken, I took the seat off and attached it to the back for the back of the kitchen. I used a sawzall to cut out a piece of the top for the sink and inserted the sink. I took the drawers out and made shelves and then made the little curtain. I had a little shelf from IKEA that just attach to the wall to use as a picture shelf. I cut this and put one on top of the piano bench and then made a shelf. I cut out little circles for a burner. It turned out so cute and my daughter loves it! This entry was posted in Rasing Kids for The Good Life-YIKES! Big Job. and tagged dresser kitchen. Bookmark the permalink.